The United States is a land of vacation opportunities. From sea to shining sea the United States boasts a range of climates and topography. As a result, even the pickiest of vacationers are able to find what they are looking for. With the charm of the south, the ruggedness of the west, the culture of the east, and the hominess of the north, there are vacation spots for every personality. There are many more spots that could have made this list as well. We believe though that this list of best vacation spots in the U.S. will have something that speaks to you! So look through this list and find your next great vacation destination. If you have already visited one of our picks, please comment with any suggestions and tips that you may have. Also, If you are looking for more travel destinations visit our list of the best cities to visit. A cultural melting pot, New Orleans offers a lively nightlife, unique food options, and charm galore. Be sure to check out the French Quarter and one of the many music clubs in New Orleans. And of course, if you are in town when Mardi Gras is happening, be sure to participate in this one-of-a-kind celebration. Rugged and scenic, Jackson Hole is an outdoor paradise. From eco-tours to fishing to river adventures to skiing, there is something to do in Jackson Hole year round. Elegant dining and luxury accommodations are also available. So whether you prefer the indoors or out, Jackson Hole will be able to cater to you. Situated in the middle of the Mojave Desert, Las Vegas is renowned for its nightlife. Entertainment and gambling options abound up and down the Las Vegas strip. Not to mention world-class restaurants, top-notch hotels, and shopping as well. For a truly unique vacation experience, Las Vegas is not to be missed. Artistic and surprising, Portland, Maine offers something for everyone. Some of the best seacoast on the Atlantic is located in Portland. Also, quintessential northeastern lighthouses and lobsters are a staple of the area. So after soaking in the great outdoors, head into town for local drinks and food, and admire the many Victorian-era homes. When you think of Washington, D.C. you immediately think White House and national monuments, and these are worth a trip all on their own. Now add in word class museums, shopping, and dining, and D.C. is even that much more appealing. All this comes together to make Washington D.C. an excellent place to vacation year round. A vibrant, tropical city, Miami is a happening fashion and nightlife city. White sandy beaches, high-end shopping, and stellar gastronomy also abound in Miami. A robust Cuban presence also exists in Miami. So get ready for delicious Cuban food and music around every corner when you visit Miami. With the motto of “Keep Portland Weird,” Portland, Oregon is a unique and quirky city that is full of fun things to do for all ages. Eco-friendly, Portland is great for nature lovers and bikers. Portland also has a number of local microbreweries and coffee houses, ensuring that you are well “hydrated” on your vacation. Breckenridge is famous for its skiing and for a good reason – it’s world-class. But don’t think that Breckenridge is just for skiing. There is a bustling city scene complete with world-class dining, shopping, and spa services. Perfect for group or family vacations, Breckenridge is a premier vacation destination. Are you a ski junkie? Our list of the best ski resorts in the US will provide you even more great ski destinations. Asheville is situated in North Carolina’s picturesque Blue Ridge Mountains. It is a fun, artsy city that is great for the young and young at heart. Art features prominently here, with a dedicated Art District. Along with great art, great dining options also abound in Ashville. When you are done touring downtown, be sure also to check out the famous Biltmore Estate as well. It is the largest privately owned house in the United States. Located in central California, Big Sur is a rugged stretch of coastline known for its jaw-dropping views. It is also home to numerous state parks. The famous Highway 1 also cuts through the region, making it easy to enjoy the views from the road or on foot. If the beach and nature are what you have in mind for your next vacation, Big Sur is the place to be. Few sites are as iconic as the Grand Canyon, and for a good reason – the Grand Canyon is truly spectacular. If you have the energy, hike to the bottom, but otherwise, you can opt for short hikes or a helicopter tour. For a vacation that you will remember forever, visit the Grand Canyon. Water views, history, and iconic professional sports teams – what more could you want? When you visit Boston, walk the Freedom Trail for a taste of early American life, visit the picturesque harbor, and eat some top-notch seafood before you take in a game at Fenway Park. A charming city full of life, Boston is a premier east coast destination that should not be missed. There is a reason so many songs and movies center around NYC. As the largest city in the United States; it is home to premier dining, shopping, and entertainment venues. Full of life at all hours of the day, NYC is energizing, vibrant, and is a must visit vacation spot. When you do decide to visit New York City, make sure to checkout our list of the best museums in NYC and also our list of the best restaurants in the city. Home to North America’s tallest mountain (Mt. McKinley), Denali National Park covers millions of acres in Alaska’s rugged interior. With jaw-dropping scenery, unique wildlife, and one of a kind adventures (think dog sledding, helicopter rides, etc. ), there is sure to be something to please everyone. For even more national parks make sure you visit our list of the best national parks. If your idea of the perfect vacation is a relaxing day at the beach, look no further than the Outer Banks. White sandy beaches abound, and are not so busy you lose the peace and quiet. Southern hospitality also abounds here, making it easy to have a good meal at a reasonable price. A great family vacation spot, Outer Banks should not be missed during the summer months. Picturesque and historical, Savannah is just under two hours from another best vacation spot on this list – Charleston, South Carolina. Savannah’s cobblestone streets lend themselves well to exploration and enjoying the city. There are also a number of revolutionary and Civil War landmarks to explore, as well as family-friendly beaches, and a host of water activities. Once the summer playground for American socialite families, Newport has a long and storied history. Today, vacationers can tour extravagant sea-side mansions, lighthouses, and other historic sites. You can explore Newport by bike, boat, or walking, whatever best fits your style. Newport also offers some fantastic golf (the first U.S. Open Championship took place in Newport), great beaches, and unique wineries and breweries. Eclectic and colorful, Santa Fe is a city like no other. With its unique markets full of galleries and boutiques, Santa Fe is a shopper’s paradise. Shopping isn’t all Santa Fe has to offer, however – Santa Fe has a number of famous hiking trails, as well as top-rated spas and museums. Just a short ferry ride from mainland Washington state, the San Juan Islands are a unique and special archipelago of islands. Mellow and laid-back, these islands boast a year-round temperate climate. They also offer stunning shorelines, beautiful farms and nature, and some of the best whale watching in the country. If you are looking for a unique and memorable vacation spot, the San Juan Islands are just the ticket. Known as the live music capital of the world. Austin also features a dynamic dining scene, top-notch art, and great outdoor activities. The city is also perfect for both families and singles, and is never lacking in activities and festivals. With iconic landmarks like the Golden Gate Bridge, Lombard Street, and Alcatraz, San Francisco is full of must see sights and activities. San Francisco also has top-notch dining. From a bowl of chowder on Fisherman’s Wharf to an array of Chinese food in Chinatown to fine dining, San Francisco is the perfect place to enjoy a delicious meal after a great day of exploring. Just a short drive from Tampa, Saint Petersburg is a vibrant, artsy city with plenty to do. There are a number of top rated beaches both in and around Saint Petersburg, as well as outstanding art museums and fine dining. Sports fans can also take in a Tampa Bay Rays game, or venture just outside the city to visit the spring training homes of a number of MLB teams. Leave your car behind when you visit Mackinac Island – this island is automobile-free. Instead, explore idyllic Mackinac Island on foot and take in the art scene, the rugged coastline, and the top-notch dining and lodging. Or, if you prefer, explore the island by bike, horseback, kayak, or horse-drawn carriage – Mackinac Island has something to offer everyone. The oldest city in South Carolina is a fan favorite for visitors from all over. Year after year travelers rank Charleston as one of the top places to visit in the United States. From its tennis to its beaches to its stately architecture, Charleston’s mild climate allows visitors to enjoy its sites for most of the year. Located in northern Idaho, there are more than 55 lakes within the easy driving distance of Coeur d’Alene, including Lake Coeur d’Alene itself. Whether it is winter or summer, there is always something to do in scenic Coeur d’Alene. Activities include skiing, boating, golfing, and a ton more. Also, if you get tired of the beautiful outdoors, there is plenty of dining, shopping, and entertainment options as well. 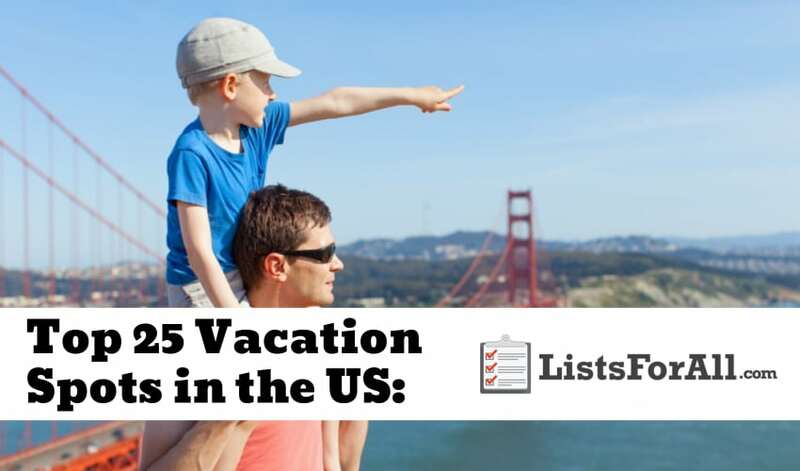 We hope that with this list of the best vacation spots in the U.S. we were able to add a couple of new places to your bucket list. And, also show that there is most likely some fantastic places to visit within a short distance to you. If you have been to one of these places we would love to hear about it in the comments below.